Vale Of Belvoir Dog Training Club is run by Pen and Paul Sensky. The obedience training is primarily run by Pen who is a member of the Association of Pet Dog Trainers (MAPDT No. 1124) and the Institute of Modern Dog Trainers. She is a member of the Kennel Club Accreditation Scheme for Instructors and has an MA Degree in Canine Training, Agility & Sports Behaviour and an SAC Diploma in Sports Psychology. Pen makes a point of keeping abreast with modern training techniques and attends local and national training seminars. All training methods used are positive and reward based with emphasis on fun and enjoyment for both handler and dog. 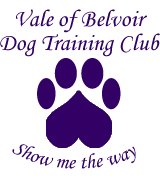 Vale of Belvoir Dog Training Club are a Nottinghamshire based dog training club running obedience training classes at all levels. We also offer other classes, including scentwork and agility (through Agility Nuts DTC). Copyright © 2019 Vale of Belvoir Dog Training Club. All Rights Reserved.